Stakeholders debating Circular Economy and Sustainable Development at the VinylPlus Sustainability Forum 2017. The VinylPlus® programme brings together the entire PVC value chain – resin producers, additives manufacturers and converters – in the EU-28 plus Norway and Switzerland. With nearly 570,000 of PVC recycled in 2016, CO2 savings from PVC recycling in Europe is now at around 1.1 million tonnes of CO2 saved per year. The contribution of the European PVC industry’s Voluntary Commitment to the SDGs has been assessed on the basis of the ‘SDG Compass – The guide for business action on the SDGs’, developed by GRI, UN Global Compact and WBCSD. 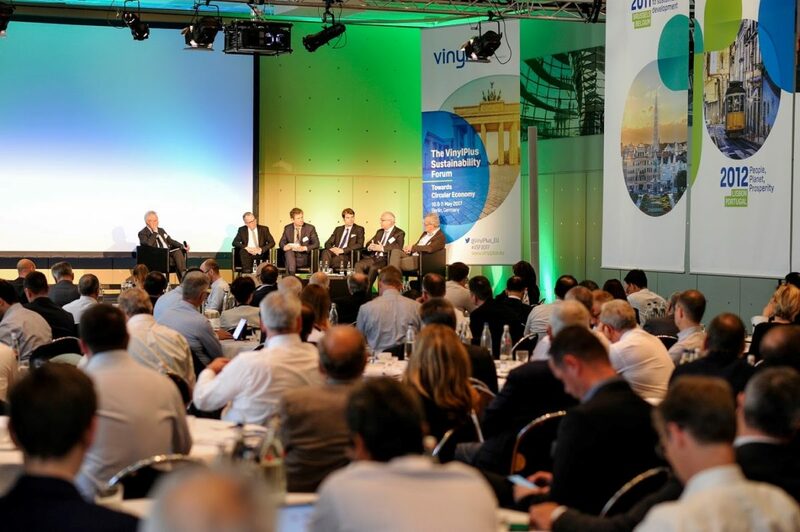 VinylPlus® is the renewed ten-year Voluntary Commitment to Sustainable Development by the European PVC industry. The commitment was developed through dialogue with stakeholders, including industry, NGOs, regulators, civil society, and PVC users. It covers the EU-28, Norway and Switzerland. Promote sustainability awareness and the concept of circularity along the value chain and among stakeholders. Enabling conditions and key elements for success are: the involvement of the entire value chain; concrete and measurable targets and deadlines; research and innovation; strong governance and accountability; stakeholder engagement, and transparency and dialogue. VinylPlus® is registered as a SMART partnership on the UN Partnerships for SDGs Platform. In 2016, the amount of end-of-life PVC recycled within the VinylPlus® framework reached 568,696 tonnes from nearly zero in 2000, with 1.1 million tonnes of CO2 saved and 1,100 jobs sustained or created. Using recycled PVC helps meet resource-efficiency targets and allows the preservation of natural resources. It has been calculated that CO2 savings of up to 92% are achieved when PVC is recycled: recycled PVC’s primary energy demand is typically between 45% to 90% lower than virgin PVC production (depending on the type of PVC and the recycling process). PVC resin producers decreased energy consumption by 10.2% by 2014 compared to 2007, and are on track with the target of a 20% reduction by 2020. Development of the Additive Sustainability Footprint methodology which is a voluntary approach to assess and promote the sustainable use of PVC additives in various product applications. VinylPlus® is fostering innovative collaborations along the value chain, and with other businesses (including recycling industry, building and construction, automotive, packaging, medical devices, furniture), academia and PVC users. The VinylPlus® programme is privately funded by the European PVC industry and requires significant financial commitment. Despite the persistently adverse economic conditions, the European PVC industry invested over 5,5 million Euro in 2016, of which 3.7 million Euro in waste management and technical projects. Predictable and reliable policy frameworks are critical for industry’s long-term investments in research, innovation and technological development that can foster transition towards a low-carbon circular economy and sustainable development. Recently, uncertainties in the implementation of relevant EU regulations had negative consequences for investment in the research and development of new products and markets for recycled PVC. Legacy additives (substances that are no longer used in new PVC products but that can be present in recycled PVC), in particular, remain an open issue, which has had a negative impact on demand for recycled PVC. VinylPlus® remain confident that the ever-increasing number of studies in support of PVC recycling and of recycled product safety can lead to balanced solutions that combine maximum safety with increased potential for recycling. 4) European Plasticisers, representing the eight major European producers of plasticisers and intermediates. They employ approximately 1,200 people in plasticiser production.